Hey guys! So I’m not a huge makeup person. Honestly, I much rather just sit around in my pajamas with my hair in a knot, but sometimes, I actually have to enter the outside world and look presentable. I don’t wear makeup everyday (one, too much effort and two, that’s not the best thing for your skin). I usually wear makeup on special occasions like events, meetings, interviews, parties or if I have to meet someone important. I watch a lot of YouTube videos and everyone always raves about high end brushes, but I found a lot of great quality and really affordable brushes that you can get at your local drug store or even Wal-Mart! I like using this brush for my foundation and concealer. The brush itself is pretty soft and has a flat surface and flows easily around my face. It doesn’t absorb product and it allows you to really buff in the foundation, for a nice even look. I got mine at Walgreens a few years ago and it still looks brand new! I use this for blush and for setting powder. Again, this brush is really soft and has a curved shape, which is great to apply blush to your cheek area and then blend it out. It has a bit of a tapered tip for precision as well. I also like using this for setting powder because of its shape — it fits easily under and around my eye area and around my face in general. The bristles are really free flowing so it gives you a lot of flexibility. It also picks up a lot of product so you don’t have to worry about not getting enough (tap off that excess though!) I also have had this for years and got it at Walgreens. This is a great little set that I found at Walgreens a few years back as well. You essentially get four brushes in one, each with a unique task. One brush is the “shade and define brush” (the brush with the liner tip). I use the fluffier side to apply my base shadow all over the lid. I don’t use the liner side that much, but when I do, it’s either with powder or gel liner. The second brush is the “blend and smudge brush.” I use the short smudging side to actually put shadow in the other area of my eye and the inner corner. It picks up a lot of product and is pretty stiff. The blending side comes to a bit of a soft point and is really good for applying transition shades and also just blending out edges. All four are soft and really flexible, but not so flimsy that you have no control. They also pick up a lot of product. I use this brush for so many different things — contour, highlight and setting powder. The brush itself is really soft and flexible and comes to a tapered tip (well duh…). It is still stiff at the base of the brush, so it gives you a lot of control, which is why I like it for contouring. Its tip is great to get right into my cheek bones and it also is great at blending out the color. For highlight, I like it mainly because it picks up a lot of product and also is not too big and not too small, so it is a great fit for the tops of my cheeks. And for setting, the tapered point allows it to fit and curve with the natural shape of my eye, making it really easy to use! I got mine at Wal-Mart. Yes, a one dollar brush can do wonders! The site calls it an essential brush but on the brush itself it says “professional” so don’t be confused by that. I use this one to put darker shadows on the outer corner, to put shadow on my lower lash line, and even to apply bright inner corner highlights/shadows. It’s a small, stiff brush that still has some wiggle room so you can blend. It is also has a tiny bit of a tip (more like a rounded top) for more precision. I think I got this either online or at Wal-Mart but either way, it’s a great brush to have for small detail work! 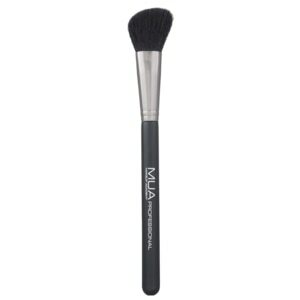 Like the others, this brush is soft, flexible and great for blending. I will use this to put shadow on the outer corner and then blend it out. It’s not a flat top (it is slightly rounded) but it acts like one, allowing for great blending. Again, my brush says “professional” and the sites say “essential,” so don’t be confused. I probably got mine from Walgreens or online. This brush is actually pretty flexible and really soft (I’ve said that like 100 times now but I’m being honest!) I like to use this to pack shadow on my lid. It picks up a lot of product and easily transfers it over to your eye and on top of other shadows. I got mine at Walgreens. Okay so when I got this, my brain wasn’t working and I thought it said contour. Then I got home and saw “concealer” and felt really dumb. BUT it works great for both! I started using it for contour to set down the initial part of the “carving out” process. It’s really soft, moves easily and has a curved shape. It fits nicely into my cheek bones and is really great at blending. This week I actually started using it for its real job (concealing) and it does amazing at that too! It picks up just enough product and blends out those harsh lines really well. I continue to use it for both! I got mine at Wal-Mart. I like to use this brush for my nose (on days where I’m like really motivated). It’s short, soft and stiff, which makes it perfect for small detailing anywhere on the face. Sometimes I will use this to contour my eyes/create a transition shade for my shadows. And it blends really well so you don’t have to worry about harsh lines. I got mine at Wal-Mart. I actually use this brush for both blush and contour. For blush, it picks up a lot of color and makes applying it to my cheeks really easy, because of the angled shape. The brush itself is semi-stiff, but still allows movement for blending. And the sharp edged cut makes it great for contouring because I can get it right into the hollows of my cheek. The only negative I have on this is the price — I’m sure I could have found one for a lot less. They sell a whole line of MUA brushes exclusively at CVS. I got this brush because I wanted to see what the hype was about for eye blenders. I was using my EcoTools one, which is great, but I like this one because of its small size. It is small, soft, has a stiff base and yet a lot of room for blending and movement. Its tapered edge/point also allows for a lot of precision if you want to carve out a crease or really blend out shades. I got this one at CVS as well. What are your favorite brushes? Have you tried any of these? Let me know in the comments below! Yes! 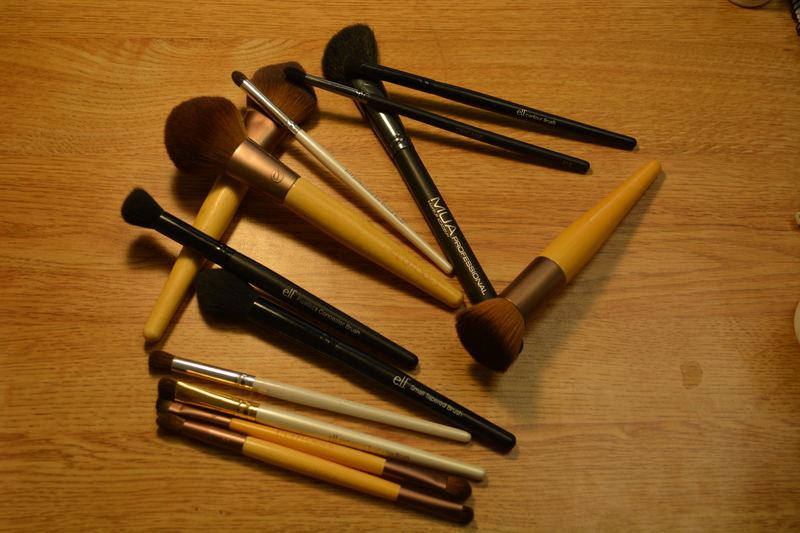 I’m a college student too so finding great quality yet affordable brushes has been a task! Definitely check out EcoTools, I know Walgreens has tons of different brushes on their stands. Let me know if you find some other great ones!